Anton Shekhovtsov's blog: A Putin in the heart of Europe? A Putin in the heart of Europe? Hungary’s Prime Minister Viktor Orbán’s declaration in summer 2014 that his government was going “to build an illiberal nation state” was far from a revelation. Rather, it was a statement of a long-acknowledged fact: Orbán’s Hungary is increasingly becoming a right-wing authoritarian kleptocracy bearing a growing resemblance to Vladimir Putin’s Russia. The pro-Putin United Russia party formed its first parliamentary majority after the 2003 elections. Putin took this opportunity to modify the electoral law to marginalise minor parties in the next elections and strengthen the major parties and, in particular, the United Russia. These changes helped the United Russia to win enough seats in the 2007 parliamentary elections to form a constitutional majority. Since Orbán’s party Fidesz returned to power after the 2010 parliamentary elections, he has moved swiftly to consolidate it. Amid the popular disappointment with the previous, Socialist-led government that failed to effectively tackle the 2008 financial crisis, Fidesz and its minor coalition partner Christian Democratic People’s Party secured two-thirds of the seats in the parliament. Forming a parliamentary majority allowed them to modify the country’s constitution, including the electoral law, in 2012. The electoral reform helped Orbán retain the constitutional majority after the 2014 elections. The modification of the electoral laws to the benefit of Fidesz or the United Russia was not the only instrument of seizing and maintaining power. Three steps were crucial in this process. The first step was to take control over the judiciary aiming to use it as a tool of political pressure. In Putin’s Russia, judicial independence was undermined by Presidential Administration and Security Services; according to Constitutional Court Judge Vladimir Yaroslavtsev, judiciary in Russia may be independent when addressing minor issues but will conform to the authorities in politically sensitive cases. In Orbán’s Hungary, members and sympathisers of Fidesz are the main source of leadership in courts of different levels. The Fidesz-initiated amendments to the Constitution, as former president of the Constitutional Court László Sólyom put it, removed the last traces of separation of powers from the Hungarian constitutional system. The second step was to undermine the media freedom. Putin chose to curtail the freedom of speech through the direct and indirect state ownership of the major national media and exertion of psychological and physical pressure on independent journalists and media companies. The murders of Anna Politkovskaya and Natalya Estemirova are only the best-known cases among dozens of others. In his turn, Orbán chose to introduce an institutionalised way of controlling the media: the pressure is exerted through the National Media and Infocommunications Authority whose members are elected by the Fidesz-controlled parliamentary majority. The head of the above-mentioned Authority also chairs the Media Council that regulates media content. Both chairs of the Media Council in Orbán’s Hungary, late Annamária Szalai and Monika Karas, have been linked to Fidesz. 80% of the population have access only to the Fidesz-dominated media. The third step was to appeal to ultranationalism as a source of internal political cohesion. Both regimes consider their nations as organic communities threatened by external and internal enemies. Orbán never misses a chance to slam “profiteers, monopolies, cartels and imperial bureaucrats” of the EU that allegedly want to damage the well-being of Hungarian families. Putin’s Russia is straightforwardly anti-Western, with an emphasis on anti-Americanism. The US is presented as conspiring against Russia and using its political and economic weight to incite the EU to do the same. The internal enemies vary, but “national traitors” and foreign NGOs are common targets in both regimes. They are also concerned about the alleged foreign imperialism and its attempts to turn their countries into colonies despite both Putin and Orbán being revisionists whose visions of the borders do not coincide with the internationally recognised status quo. For Putin, the collapse of the Soviet Union (1991) was “a major geopolitical disaster” of the 20th century that damaged the “Russian world” he is now trying to rebuild by endangering the post-war order. For Orban, the Treaty of Trianon (1920) after which Hungary lost around 70% of the territory of the Kingdom of Hungary was a disaster for ethnically defined “Hungarian-ness”. The political systems under Orbán and Putin are right-wing kleptocracies in which the political power of the elites is used to extend their personal wealth at the expense of the wider population and provide material reward to loyal supporters of the regimes. Orbán’s Hungary is a milder version of Putin’s Russia, although the situation in Hungary has been deteriorating every year since 2010. The crucial difference is that Hungary is a member of the EU that can exert significant influence on Orbán’s domestic policies. However, it also seems viable that the potential strengthening of Russia as a regional power may produce further toxic effect and reinforce the illiberal tendencies not only in Hungary but in other Central European countries too. 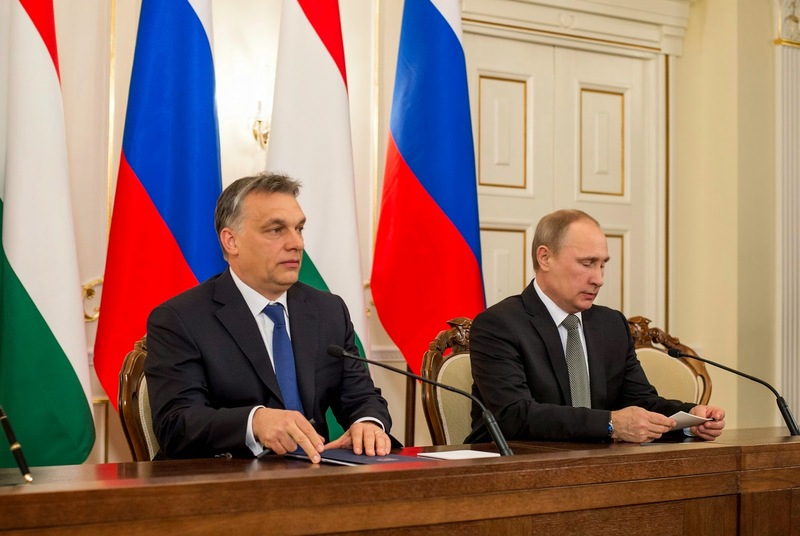 How is the relationship between Orbán and Putin? Orbán seems a good friend of Putin's Russia, but Jobbik seems more obsequious. What do Orbán thinks of that special friendship of Jobbik with Russia? Recently Orbán banned a conference organised by American neo-nazis where Dugin was the main guest. The organisers were expelled of Hungary and Dugin couldn't even enter into the country. Could be Orbán supicious of Jobbik's friendship with Russia? My guess is that, for Orbán, Jobbik's friendship with Russia is not important. His own cooperation with Putin's regime is much more significant. Orbán needs Jobbik for domestic political reasons, but he needs to keep them at a particular level of popularity. If they grow bigger, he will do his best to cut them back. How is Orban's government a kleptocracy? ?